Happy Salmon is a delightfully simple game that is way more fun than you expect it to be. The rules are simple and it has replayability. It is fast paced and players play simultaneously, so there are no turns. Each player has a deck of 12 cards which is their starting hand. The goal is to discard all the cards in your hand. You can discard a card when you match that card with another player. The first player to match all their cards, and discard their hand, wins. There are four types of cards in each player’s deck: “High 5”, “Pound It” (fist bump), “Switcheroo” (trade places), and “Happy Salmon”. You hold your deck face down and turn over one card at a time. How do you find a match? You call out what your card is, looking for another player doing the same. It winds up being like those films of stock traders trying to buy and sell stocks, with everyone calling out and looking for a match. If you can’t find the match to your current card, you can pass that card to the bottom of your deck and try the next card. However, you can only try to match one of your cards at a time. After each round, players can find all their cards again because each deck of 12 cards has a different color on the back and two corners of the front of the card feature that same color. I like that you can find your cards whether they are face up or down. It’s a tiny bit of chaotic fun that lasts a few minutes, about 5, but it is highly entertaining and oddly satisfying. Plus it’s one of the few card games I know of where you stand up to play. So it’s a little more energetic than other games, and a nice break from sitting. After I play a round or three, I feel better, and happy and more alert. It’s an easy game to grasp, and kids have no trouble understanding the rules. It’s a great first game for a Game Night, or as a game to play in between other longer games. Since the game plays in minutes, you can have a few rounds and players can easily rotate in for a game and rotate out. It is also very compact, so it would be easy to bring on a camping trip. Personally, I don’t think I could play more than 3-5 rounds at a time, so it won’t be the only game you play all night. 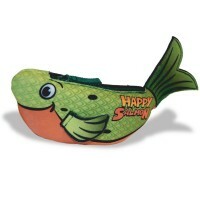 Plus it comes in it’s own Happy Salmon carrying case. You need at least three players, the more the better. When someone described this game to me, I thought it sounded ridiculous, and then I watched a game play video and I knew I wanted to play. I bought the game the next day. If you are looking for a quick game for people of all ages, either for your family or for any event where you might play games, I highly recommend this game. I think everyone who has games shoud add this to their library. This game takes a minute to learn and 5 minutes to play; fun for almost any age. 6 player or with the Blue Salmon expansion 12 players. But spectators will be as entertained as the players. I have gifted this game to several young families because of its simplicity and silly fun. If you can high five and fist bump, you can play. Happy Salmon has also come out with Funky Chicken which can be mixed with Happy Salmon for more crazy fun. Add a Review for "Happy Salmon"